I was a bit sceptic to start with but am very happy to have got Paul to install our softener. 6 weeks in and I cannot find a bad word to say about this system. Everything remains clean, no scale on anything anymore. I checked inside the kettle and despite being four years old it looks new. The shower, basin and toilet don't need the hard scrubbing of the past. The soft water is helping my eczema too. All round a well worth product. Very happy with it. Having had a bathroom suite installed and seeing how over the previous years the hard water had discoloured, stained the bath, plus surrounding tiles etc, which was always a losing battle to keep clean. Plus the continuing battle with the shower head being caked up with scale so much so that sometimes without descaling first you couldn't take a shower as the water flow was so weak. ……….. I would highly recommend this company to anyone and would also recommend getting a water softener to all my friends who live in hard water areas (they are sick of me banging on about how good it is). Since using the softener I have noticed a huge difference in all ways, including the drinking water being so much nicer and wish I'd had it done years ago. Really easy to maintain, made easier by the team already agreeing to remind me of servicing when it is due (in a couple of years). 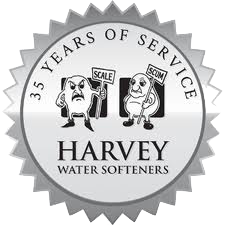 My softener was installed on 30 October 2018 by Paul and his team. Everything was explained fully prior to installation; they were very professional, friendly, clean and nothing was too much trouble. The team did a great job installing the softener, they were very efficient and cleaned up after themselves. They explained how to use it and to call them if anything went wrong - which hasn't happened so far! The new softener works better and uses noticeably less salt than the old one! Your right, even the whisky tastes better! Good job all round. It was a pleasure to deal with your Company. A fantastic water softener has been installed and now NO MORE DRY SKIN. Thank you. Great service and very knowledgable, good advice. Am loving both the water softener (less cleaning to do from no hard water marks! ), and also love the Quooker tap - saves so much time. 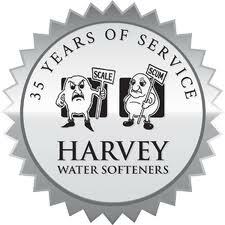 We asked Paul if he could supply us with a new Harvey’s softener which was installed a month ago. Dan the engineer came at our convenience, and nothing was to much trouble.Just topped up with our first bag of salt.Lovely water once again.Highly recommended.My wife likes the washing powder which is specifically made for water softeners. Friendly and efficient service. The Harveys HV3 was installed in less than 3 hours and the engineer also sorted out the terrible mess of pipes under my sink. We now have lovely soft water. Excellent Service, Polite and efficient. One minor problem dealt with without question. What a great Engineer Dan was. Clean and Polite. Call, order online or pop in our shop in Wimborne for salt and filters . Pickup or delivery from our friendly staff. The local independent experts in water softener installation, maintenance and breakdown recovery near you. No job too big or too small, we will be there when you need us. Our trained engineers are not only professional and experienced, but they are also fully trained and are specialists in their field. You can trust us to deliver results quickly and efficiently.